It seems like only 114 years ago that Anders Nilsson Östlind founded the Östlind & Almquist piano and orgelharmoniumtillverkare firm in Arvika, Sweden. And since then, we’ve seen youngsters' interest in mastering acoustic instruments gradually totaled by TV and computers. The more things change, the more they get different, except some things that didn’t and which are now pickled in binary by the boffins at Toontrack. 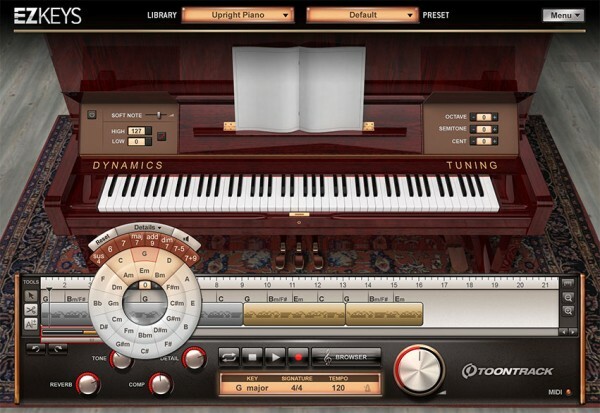 Back in the day (last March), the Toontrack EZkeys Grand Piano set muzos a-drool, but not so much with its sample library taken from a Steinway Model D. The main draw was the double-whammy of educative potential and songwriting up-soup. MuzoBlog evaluated EZkeys Grand almost as soon as it slipped block and tackle to crash, tunefully, onto review street. Rather than reiterate the findings here, bear in mind that with the Upright, core-system specs have not changed fundamentally and similar conclusions can be drawn regarding what it brings to the songwriter’s garret. Read this for the Grand MuzoBlog appraisal. Got that? 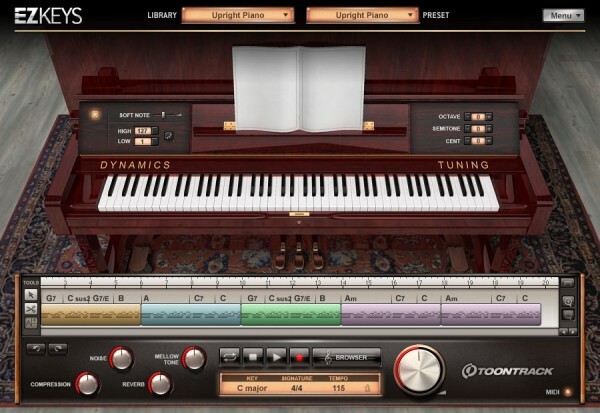 Upright is as grand a songwriter’s ally as Grand and its educational potential as mighty (Toontrack even offers money-saving bundles for music faculties and their needy students). If you’ve graduated beyond eligibility for education discounts, EZkeys is still a steal at £111 from Eurodistro Time+Space, or direct from the Toontrack website. If you’ve already bought EZkeys Grand, there’s an upgrade to Upright’s sound library priced £54.95. And it’s here where Toontrack has leapt off its laurels like Pearl (a singer) dispensing with a piano stool. In the original MuzoBlog assessment, there were reservations about the quality of Grand’s sample library. While a winner in all-round, music-making goodness, its raw sounds were thought somewhat limp. All good stuff, but now to the real excitement. Yes, them there sounds are good enough to make the tedious aspects of piano practice that much less of a drudge. We’ve audio examples below, but it’s worth flagging certain of the patches (not that pianos are patchable). Both of the Britpop offerings make ears prick, a dollop of compression boosting the instrument’s apparent richness. Saloon is a gas if aiming for 19th Century barroom kitsch, a welcome detune function evoking the atmosphere of Western movies. For acid casualties, there’s the time warp of 90s Dance, taking one back to a time that, for some reason, is difficult to remember clearly. Just hammer out syncopated cluster chords, record, loop their playback and make rhythmical hand gestures while gurning (that latter’s called tardive dyskinesia, y’know). So there they be. The songwriting smarts you’d expect from EZkeys, a healthy dose of educational resources and sounds that’ll happily sit in mixes covering a variety of genres with minimal tweaks. That said, Overloud’s built-in processors are impressive and offer good scope for further tone-shaping. Toontrack has come up with a good-value, attractively designed package that’s as useful in the student’s practice room as it is in a creative’s project studio. The story doesn’t end there, however. 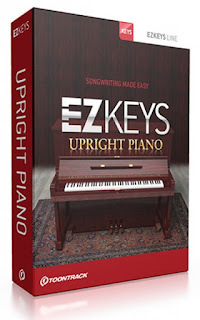 Albeit that you can drag third-party MIDI files into EZkeys, the developer offers themed MIDI packs, thus far covering pop/rock, gospel and, just lately, blues. So if you need a leg-up into an unfamiliar genre, they’re certainly worth a listen – search Time+Space’s product pages for more SoundCloud-hosted audio samples. To round off, let’s go back to the beginning and ogle our final video du jour which explains what underlies this EZkeys initiative. It’s hard to think of another software developer that has hit the songwriting, educational and pianoforte-tech nail so triangularly on its three heads. Let’s hope the range continues to expand in the same supremely useful way as sister product line EZdrummer. So, you cunning Swedes, perhaps you’d like to ponder such words as clavinet, harpsichord, tine, tonewheel, etc, and see what pops into your fevered imaginations.